While filming the Get RIPPED! videos, we were fortunate to have some amazing people take part in the workouts. We’d like to introduce you to the participants in the Get RIPPED! video series. As you read their biographies, you’ll see that they are busy, successful people who got the results they wanted from the Get RIPPED! program, and made peak fitness a vital and enjoyable part of their lives. Thanks to everyone for their fabulous performances. And yes, making the videos has been as fun as it looks in the workouts! The Get RIPPED! workout promises the results you crave in just weeks. Developed by medical professionals and Jari Love, this workout is designed to burn calories directly from your carbohydrate stores, producing the most effective weight loss possible. Krista Guichon has practiced physiotherapy for the 27 years has spent the last 23 years within the private practice setting. She has contributed greatly to the RIPPED! program with her expertise and input on safety and technique. Krista enjoys participating in outdoor recreational activities with her husband and three daughters. Krista has made a commitment to staying active and loves hiking and mountain biking in the summer and skiing or snowboarding in the winter. The RIPPED! program has helped her keep her physical fitness at a very high level so she can successfully continue to enjoy her pursuits. Krista’s calm and professional demeanor have brought her a great deal of respect from everyone involved in the RIPPED! videos. Laurie balances her love for athletics and her passion for public health by working full time as a Program Consultant for tahe Public Health Agency of Canada and part time as a group exercise instructor. Laurie completed a Master of Science (MSc – 2006, University of Calgary), a Bachelor of Social Work (BSW – 1999, University of Calgary), and Alberta Fitness Leadership Certification (AFLCA – 2005, 2007, 2009, Provincial Fitness Unit, AB). Laurie believes that health is multidimensional and transcends physical health to include other components including mental, spiritual, and emotional. Laurie’s goal is to promote health through a strengths based approach – continually seeking ways to engage and empower diverse participants and communities in their health and fitness journeys. Laurie currently instructs three-four RIPPED! classes per week along with volunteering at the Calgary YWCA. In addition to her AFLCA certification, Laurie seeks out new fitness training opportunities to expand her knowledge of the ever-evolving health and wellness industry. As a RIPPED! Instructor, Laurie is motivated every class by the commitment and dedication of participants who are challenging themselves in new directions. The structured of the RIPPED! Program provides participants with education and training to learn about safe biomechanics, functional movements, challenging exercises, balanced nutrition, and support. Laurie’s lifelong journey and commitment to health is fuelled by more than physical strength gains. One of the greatest accomplishments gained since participating in her first RIPPED! class (March, 2004) is Laurie’s freedom to take more “risks.” This means trying (and often failing at) new activities – outside of the comfort zone. With each mistake comes the opportunity to grow. The benefits of “risk-taking” far outweigh the consequences of failure. For example, Laurie has expanded her athletic and educational pursuits to include mountaineering activities (such as scrambling, rock climbing, glacier travel); participating in and instructing a greater variety of group exercise classes; and tackling a broader range of health issues (through a health promotion approach). Guarantee: if you cannot locate Laurie at work or in the gym, she will be out exploring the next mountain peak (while in the company of great friends, family, and her dog Kinta). Which challenge (or peak) is next? Terry is a Calgary based securities lawyer who has maintained a lifelong commitment to fitness. Terry played competitive hockey into his mid-twenties, until graduating from the University of Calgary and pursuing his law career. During his time spent in the hockey world, Terry developed the basics, and realized the value of consistent resistance and cardiovascular training to enhance both athletic performance and overall quality of life. Get RIPPED! 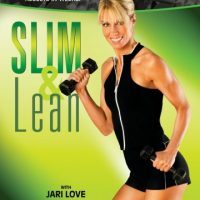 Slim & Lean, takes what you’ve built in the first video and kicks it up 10 notches! Like Get RIPPED!, the focus is on high reps and light weights to create definition, build lean muscle, and burn calories. We’ve added some new exercises and pumped up the intensity! The whole body becomes lean, shaped, and toned. As in all the RIPPED! videos, we demonstrate modifications so that everyone can do this workout. Laurie balances her love for athletics and her passion for public health by working full time as a Program Consultant for the Public Health Agency of Canada and part time as a group exercise instructor. Brian is an elementary school principal, has been married for over 30 years and has four children. An avid runner, Brian has completed 17 marathons and is still setting new goals for himself. His current ambitions are to run in the Boston Marathon, learn to swim, and complete Ironman Canada. Since his involvement with RIPPED!, Brian was surprised and pleased to realize that even at his age he could grow muscle and gain definition. He finds that RIPPED! allows the older, active person to push himself or herself without undue strain on the joints because lighter weights are used. Through his dedication he has seen results. Brian has found that as long as someone uses good sense and moderation, the goal of physical fitness is achievable at any age. Get RIPPED! to the Core gets results fast in a no-nonsense, full-body, workout. Through compound movements you’ll burn 2-3 times more calories than traditional weight training programs. Using dumbbells, a barbell, or your own body weight, you’ll complete 9 double-duty exercises that work multiple muscle groups at once. Break out of your plateau to achieve your desired fitness goals! Strengthen your abs in every movement using the best scientifically-proven exercises to see RIPPED! results fast. Get ready to transform your body instantly! Ben is a professional engineer working in the oil and gas industry. He is married and is the doting father of two daughters. He is also a third degree black belt in TaeKwon Do and a four-time National TaeKwon Do Federation heavyweight champion. After spending 13 years competing in tournaments, training and conducting martial arts seminars across North America, Ben is now focusing on group exercise instruction and class development. Ben is a very dedicated instructor and participant in all types of group exercise classes, ranging from RIPPED! to Spin to yoga. An AFLCA graduate, Ben can now be found teaching unique high energy group fitness classes all across Calgary. Christy Diachuk has been diligently attending RIPPED! classes over the past few years. Christy is committed and addicted to RIPPED! because it has both helped her get into shape and has improved her ability to perform in the sports she enjoys. Christy has been very active since a young age and is involved in many sports such as soccer, windsurfing, skiing, running, and biking. Christy’s other passion is the health care industry. Her interest started in university when she went to Tanzania, Africa to work on a project promoting health care to children in a small village. While in Tanzania she worked with children in a primary school educating them on hook-worm, malaria, and HIV/AIDS. She has worked in the pharmaceutical industry for many years in the osteoporosis therapeutic area. Currently, Christy works for a medical surgical company as a Spine Education Specialist helping with procedures for vertebral compression fractures. You asked for it, now you have it! Get ready to rev up your metabolism with Get RIPPED! 1000. You’ll shed fat fast by burning up to 1000 calories in one session. A former fashion model and executive secretary who was born and raised in Alberta, Gaylene has been involved in sports her whole life. Figure skating and softball were her childhood passions and she played on all the high school teams. When children came into her life she switched from organized sports to a workout regime that includes attending RIPPED! classes regularly. She is also involved in skiing, skating, water skiing, biking, and horseback riding in the mountains near her home. She currently lives on a small farm in Southern Alberta where she and her husband run a purebred Black Angus cow/calf operation. Farm life has cut into her leisure time but Gaylene has found her passion (and a great workout) in gardening and taking care of the farm. Gaylene enjoys picking up her glue gun to be crafty and loves knitting, crocheting and decorating. She has three children, three step-children and is about to become a grandmother for the fourth time. During filming Gaylene kept everyone laughing with her hilarious Vaudeville routines. RIPPED! and Chiseled burns 100% carbs to get that ultimate, lean look. Effective for both beginners and advanced users, you’ll see amazing results as you get stronger and feel more confident. Get RIPPED! and Chiseled is easy to follow and easy to learn. It burns 2-3 times more calories than traditional weight programs and is suitable for men and women of all fitness levels. At the age of 40 Judy decided to become a nurse and has since had an exciting and varied career. She has worked in Nicaragua and in the U.S. in the areas of med/surg, ICU, in maximum security prisons, and then discovered her niche specializing in substance abuse and detox. She feels she can really make a difference helping people with addiction problems. She assisted in setting up a methadone treatment program in Maine where over 1000 patients were helped to get their lives back on track. Judy currently works in acute care hospitals in chronic pain consultant services. Judy was on a women’s rowing team and for a few years was a bodybuilding fanatic and competitor. For fun, Judy now loves doing aerobics and running. Her best times are spent outdoors with her giant dogs, Tundra, a Great Pyranees, and Caplin, a Newfoundlander. Mike works as a residential building contractor in Calgary. He spends his spare time participating in intense sports. His favorite activities include running marathons and competing in ultra-distance mountain bike races and adventure racing. Mike started doing RIPPED! to stay strong in the off-season and found that it really helps to prevent injuries. He also enjoys skiing, snow shoeing, mountain biking, travelling and drinking red wine. 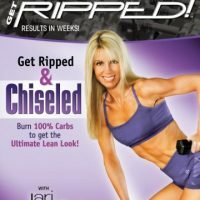 Jari Love’s Get Extremely RIPPED! will revolutionize your exercise regime! Only the most effective calorie-burning, fat-melting, high-rep exercises have been included to create two 30-minute workouts that will redefine your body. Ellie Archer and her husband Kiff have owned and operated personal training facilities in the City of Calgary for well over 30 years. During this time she taught resistance training, martial arts, self defense and stretch classes. With a keen interest in nutrition, and traditional healing, she has always been diverse in her approach to the issues of health. Ellie and Kiff now reside in the beautiful ocean side community called Bella Coola in the heart of the coastal rainforest of British Columbia. Ellie is a wildlife bronze artist and her sculptures of grizzly bears and wolves are inspired by the rich history and cultural roots which exist in this unique primordial rainforest. Though the gym is still vital to Ellie’s training regime; kayaking, hiking and horse back are her favorite ways to bring people to the edge of their limits, from which she gently encourages them to surpass. Kirsten resides in Calgary but is a Saskatchewan prairie girl at heart. Always active as a child, she spent her summers at Jackfish Lake with her parents and three younger brothers. She engaged in an array of water sports such as kayaking, water skiing, barefoot skiing and sailing. Her passion for athletics has always motivated her to try new sports and push her fitness to a higher level. Kirsten is self-motivated and takes fitness seriously. She tried her first RIPPED! class in August 2007 and was captivated by the intense energy and enthusiasm of the invigorating work out. She quickly saw positive physical and mental results from the RIPPED! training and was ultimately able to boost her metabolism, build muscle endurance, and cardio vascular strength. Kirsten now runs longer, skips faster and is stronger because of RIPPED!. She plans to set new athletic goals in the future and continues to challenge herself on a regular basis. Born and raised in Timmins, Ontario, Marc was always very active growing up. Playing soccer, hockey and running, Marc has always been very self-motivated and disciplined. He obtained a Diploma of Aviation Management in Ontario and later moved to Calgary in 2007 where he quickly made himself known at Fitness Plus. It was there that he was introduced to the RIPPED! Workouts and spotted by Jari Love herself! Jari noticed Marc because of his impeccable form and dedication to his fitness. He was selected to be tested for new RIPPED! exercises on the metabolic cart and was then offered a chance to be involved in the new videos. Eagerly accepting the invitation, Marc enthusiastically devoted himself to preparing, practicing and training for the projects. As the only male extra, Marc was challenged both physically and mentally! With the projects complete, Marc still remains a familiar face at Fitness Plus. If Jari Love’s Get Extremely RIPPED! was designed for efficiency and results, Get Extremely RIPPED! 1000 will redefine what it means to exercise. Want to rid yourself of that last 10 lbs? With Body Rock, you’ll get a RIPPED!, hard body! Are you ready for a serious shake up?! Get Extremely RIPPED! Lean Machine is just what you need to turn your workout regime upside down! If you’ve ever hit a plateau, gotten bored of your regime or lost motivation – this is the workout for you! Brittany started working with Jari in May 2007 while completing her Bachelors of Commerce degree at the University of Calgary. She has since become a Get RIPPED! Certified fitness instructor and has obtained AFLCA certifications in Resistance Training, Spin, Step and Hi-low Choreography. Featured in one of Jari’s latest DVD projects, Brittany is also involved with personal training and has trained clients in two weight-loss challenges that were followed by a local television station. Brittany is also involved in training sports teams and teaching bootcamp classes for Jari Love’s Get RIPPED! Programs. Brittany has also recently obtained certification as a Level 1 BodyMind Nutritionist, and is actively pursuing her Level 2 Certification to help clients and participants reach their health and fitness goals. Additionally, while working as Jari Love’s assistant, Brittany has been able to embrace her passions and participate in a multitude of exciting projects. She continues to work with Jari in the development of programs and new concepts in order to help others achieve success and improve their quality of life! Cheryl is employed part-time in the legal field as a document specialist in the word-processing department of a large downtown Calgary law firm. Approximately two years ago, Cheryl was introduced to the RIPPED! DVDs and became passionate about getting into shape and gaining more energy. Along with eating a clean diet, Cheryl saw gains in both muscle mass and aerobic endurance. Despite being a Celiac, which limits her to a gluten free diet, Cheryl has successfully incorporated clean eating into her daily routine, together with attending the Get RIPPED! Bootcamp classes at Fitness Plus and some one-on-one personal training with Jari. When Cheryl is not working out she enjoys walks with her two dogs (Maggie & Ruby) and entertaining with friends and family. Lisa Scheffelmaier has been into health and wellness in one form or another throughout her life. From her first RIPPED! class three years ago, Lisa became an avid participant. She loved the results she was got from the classes. Not only noticing how lean and strong she was getting, but Ripped was also helped her become better in her other fitness activities, like running. The RIPPED! classes propelled Lisa, who was a mosaic artist for 16 years, embraced a career change and become a nutritionist. She is thrilled to be coaching in her exciting new career. Lisa continues to push herself in the many fascinating areas of nutrition – from sports nutrition to raw food preparation. Her greatest pleasure (and reward) is showing her two teenage daughters that fitness, wellness and change are possible at age! Sandy Punia was born and raised in Calgary, Alberta and is a former Executive Secretary in the oil and gas industry. Sandy’s passion for fitness and exercise began at an early age. Growing up in a family of five children, with three older sisters and younger brother, her parents encouraged her to walk almost everywhere. Family vacations were mostly road trips to National Parks for long hikes, bike rides, camping, fishing trips and walks along the beautiful Canadian Mountain pathways. Sandy is a mother of two small children who keep her very busy! For many years, Sandy had been doing aerobics to stay healthy and in shape and had reached a plateau leaving her looking skinny with no definition. She started to attend RIPPED! classes in the summer of 2003 and immediately felt changes in her body that she never felt from all the years of running and cross-training. After only a couple months of attending two to three RIPPED! classes a week, Sandy felt stronger and loved the tone in her muscles. Sandy did the RIPPED! workouts throughout both pregnancy’s and was surprised at how much energy she had after her children were born. Sandy was back to her pre-baby body within a few weeks of delivery and has found that the results she receives from doing the RIPPED! workouts extremely motivating! Having been a part of Jari Love’s team of video talent has only fueled Sandy’s desire to stay fit and motivated. Sandy is constantly setting new goals for herself in the pursuit to become the best that she can be for her family, both physically and mentally. You asked for it and now you’ve got it! I have had a ton of success with the Get RIPPED! Bootcamp Program and decided it was time to bring Bootcamp to you in the comfort of your own home! Dean started working with Jari in August of 2010. He has been training for more than 35 years in all aspects of fitness, from sports conditioning to bodybuilding to longevity in physical activity. Dean understands family and job commitments and how fitness can enhance a great lifestyle. He stresses that knowledge and perseverance are the key to success. He also believes in drug-free training and to be the best you can be naturally. Dean is a Certified Can-Fit Pro Personal Training Specialist. Dean has also excelled athletically and has placed 1st twice in the Mr. Alberta Body-Building Contest. Dean has also been a City and Provincial Champion in Olympic-Style Wrestling and placed 2nd in the National Championships. Cara Fullerton is a local TV broadcaster in Calgary. She has been involved in sports throughout grade school and beyond, from volleyball to track. She took her first RIPPED! class with Jari in 2005. In her pursuit for a new fitness challenge, Cara trained and competed in a figure competition (the softer side of bodybuilding) in the Spring of 2007. She loved it so much she went on to do five more over the last three years. After learning so much about fitness and nutrition Cara developed a strong passion for the fitness lifestyle and she canâ€™t wait to learn more. Sheâ€™s has since taken the Get RIPPED! Certification course and is thrilled to be a new member of the Get RIPPED! team!. Get Extremely RIPPED! Revved to the Max is a sure fire way to take your fitness to a whole new level! Get ready for some amazing new double-duty exercises that will challenge your body and help you blast through plateaus. Similar to the original Get Extremely RIPPED! ; Jari and her team you through non-stop double-duty exercises using body weight and dumbbells so you are continually burning calories and melting fat! Jordan Gant, an MRU business graduate, currently works within the financial sector assisting in public incubation ventures. Jordan runs an intermediary investment group as well as other small entrepreneurial ventures on the side. Jordan has had a passion for music since birth. He currently writes, records, and produces for various bands and clients. Jordan is an avid sports enthusiast. From snowboarding to skydiving, Jordan enjoys participating in all sporting activities. The Get RIPPED! Program has helped Jordan overcome some of his past injuries, as well as increasing his overall strength and agility.